There were lots of burned out homes along the road to Montenegro. With the War With Croatia, the area around and south of Dubrovnik was shelled repeatedly. Local houses were looted and burned. The Serbs and Montenegrins never did get inside the Dubrovnik city walls, so the treasures were protected. There was 1 1/2 years of occupation by the army from Montenegro in the area south of Dubrovnik. 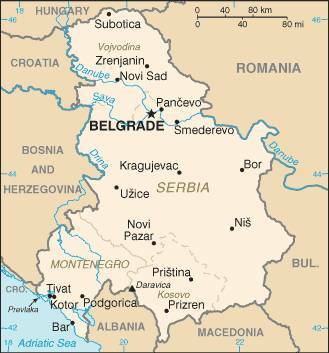 The army of Serbia and Montenegro placed land mines on their withdrawal. There is still the process of slowly removing the mines. A new border crossing is being built by Croatia, but land mines were found which slowed the project. Fields could not be farmed until mines were removed. It took 45 minutes to get to the border from Dubrovnik. Entry fee of €180 for the bus to enter Montenegro. No passports were stamped on entry. We drove around Kotor Bay to reach the town of Kotor. We had a walking tour of the walled city and a great view of a fortress on the hillside. Further south was the town of Budva. It was completely destroyed in a 1979 earthquake and then rebuilt. A little further south was the resort of Sevti Stefan - used to be an island fishing village. Now it's an expensive resort with sandy beaches. After a full day we returned to Dubrovnik for a home meal in a small village near Dubrovnik. The tour group was split into groups of 6 or 8 people then dropped off at different homes for dinner. We went to the home of Pereza & her husband with a maternal aunt helping. They spoke little English, but we had our guide with us so it was another great experience.